HACK ATTACK: The Inside Story of How the Truth Caught Up with Rupert Murdoch. By Nick Davies. Faber & Faber, 448 pages, $27. For one brief moment, it looked as though Rupert Murdoch’s international media empire might be on the brink of collapse. In the summer of 2011, Britain was in an uproar over revelations that the Murdoch-owned tabloid News of the World had hacked the voice-mail messages of Milly Dowler, a 13-year-old girl who had been kidnapped and murdered in 2002. The scandal soon spread to other papers owned by Murdoch’s News Corp. And it nearly jumped the Atlantic, as allegations circulated that Murdoch journalists had tried to listen to cellphone messages of victims of the September 2001 terrorist attacks. Yet, in the end, not much happened. Read the rest at The Boston Globe. Photo (cc) by the World Economic Forum and published under a Creative Commons license. Some rights reserved. 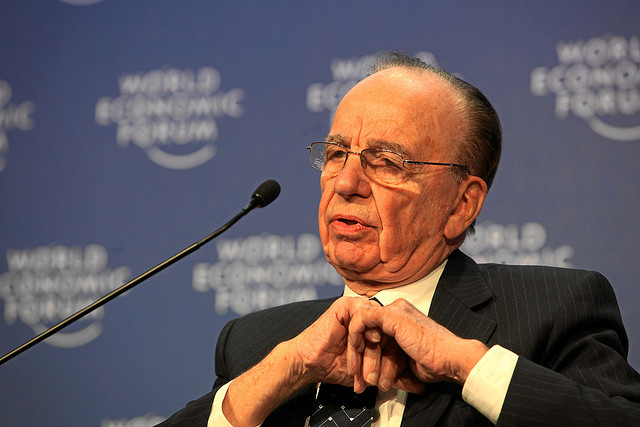 Ironically, rather than his misdeeds in the UK, some say Rupe could have been brought down by his HR machinations in the US in violation of state and federal age discrimination laws, among others. Replacing employees with little chance of new employment while years away from Social Security would seem to be a particularly cruel way to end the careers of long term Dow Jones employees, for example. If the Obama EEOC has priorities, it appears that protecting smaller, more PR-friendly classes rank ahead of baby boomers, who have become collateral damage partly because there are so many of them. When was the last time you spoke to someone between 55 and 65, in or out of the media, with a new job? Last week. In media. Overall, though, you are correct.